Fiddle fanciers will salivate over these two releases in EMI's new "Classic Archive" series of DVDs. I've seen several Classic Archive discs already, and they are just about irresistible to anyone who cares about great classical performers of the recent past such as Stokowski, Arrau, Rubinstein, Heifetz, and Richter, to name just a few. Most of the films originate from the BBC, and there is material from the European mainland too, courtesy of INA. 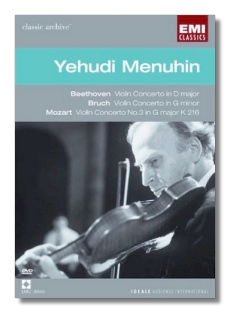 The footage on the Menuhin DVD dates from 1961-67. By this stage in his career, Menuhin no longer was an impressive technician. (Between Menuhin and Oistrakh, there is no question that the Russian was superior.) Nevertheless, mechanics aside, the Menuhin magic is undiminished in these works. Fighting the latter-day limitations of his technique, he was a warm, romantic player, and capable of generating tremendous excitement. (Try the finale of the Bruch and ask yourself when you heard it played with more fire.) Also, he was versatile – as comfortable with Bach and Vivaldi as he was with Nielsen and Bartók. Seeing him conduct a French ensemble in the Mozart, one loses oneself in the peace and balance he creates – no matter that the style is more plush than we generally accept today. Menuhin's Olympian view of the Beethoven Violin Concerto is nicely complemented by Colin Davis's incisive conducting, and the London Symphony digs in. (In contrast, Boult's contribution to the Romance is as lofty as his soloist's, and an unforgettably mellow performance is the result.) As suggested above, Menuhin sets new standards in the Bruch, and Fricsay pulls no punches with the Radio Symphony Berlin. The BBC's camerawork is unimaginative – these were the 1960s, after all – but the black and white images have held up well, lacking only modern crispness. The monaural sound is more than acceptable. I must note, however, the presence of a few very brief (less than one second) dropouts in the audio during both the Beethoven Violin Concerto and the Mozart. Oistrakh created a sensation when he finally was allowed to travel outside of the Soviet Union. The finale to the Brahms concerto, offered here as a "bonus" (is the rest extant? ), was recorded in 1958, and is really blistering – how he could play! (It's also a joy to watch Rudolf Schwarz's beautiful baton technique.) The rest of the items on this DVD were filmed in London in 1961 (Bach) and in Paris in 1962 (everything else). 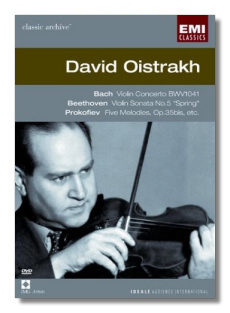 The Bach concerto, with Davis and the English Chamber Orchestra, is straight-ahead and muscular, yet Oistrakh doesn't bully the music. The material from Paris seems to have been done in a small studio. There is no applause, the camera is even allowed illuminating close-ups of Oistrakh's face and hands, and there's something close to domestic set-dressing in the pieces with Lev Oborin (Beethoven, Schubert, and the movement from Brahms' "F.A.E." Sonata). Too bad that Oborin's piano, at least as it has been reproduced here, has such a disagreeable tone. The material with Frida Bauer doesn't suffer from that fault, and their reading of the Prokofieff challenging and eerily beautiful Five Melodies is another highlight of this DVD. The sound is especially good on this DVD; the movement from the Brahms concerto is vivid despite the passage of time.